Ireland has become the first country in Europe to launch the all new Hyundai Santa Fe ahead of 182 registration plate. Prices start at €41,995 for the 2WD ‘Comfort Plus’ version with the 2.2 diesel engine. This model has a CO2 emissions g/km figure of 155 and annual road tax at €390. The entry level 4WD version is the Executive Plus starting at €45,995 with a similar engine but a higher CO2 emissions g/km of 157, so annual road tax on this will be €570 a year. Hyundai points to the fourth-generation Santa Fe being built on the company’s strong SUV heritage based on more than 1.5 million SUVs sold in Europe. It boasts that the new model is a powerful and elegant SUV with best-in-class safety features and exceptional roominess. The new model has a seven-seat configuration, and also has full automatic air-conditioning as standard. The South Korean manufacturer says that the exterior design of the new Hyundai Santa Fe is characterised by a more powerful wide stance and more athletic, bold look and refined lines. It adds that the new model’s front adopts the Hyundai’s new SUV family appearance and features an expressive and powerful look. LED Daytime Running Lights are positioned on top of the headlights, which are also LED from Executive Plus level upwards. Roof rails and a rear spoiler with high mounted brake light are also standard. Hyundai says that the new Santa Fe features many of the latest SmartSenseTM active safety and driving assistance features with standard spec. such as ‘Lane Keeping Assist’. It alerts the driver in unsafe movements at over 60 km/h by sensing the car’s position. It sounds an alarm before the car moves over white, grey and blue lines as well as Bott’s dots on the road, and warns the driver acoustically and visually before inducing corrective steering to guide the driver back to a safe position. Also standard are front, side and curtain airbags, driver fatigue detection, autonomous emergency braking and it has a temporary steel spare wheel and tyre. Hyundai adds that the new generation Santa Fe benefits from superior rigidity through the application of high strength steel, high impact energy absorption and minimized distortion in order to protect passengers in the event of a collision. Passive safety is enhanced by an increased body rigidity to protect passengers in the event of a collision. The Sante Fe’s overall weight is reduced while Hyundai says at the same time, it says that it provides top-level crashworthiness. 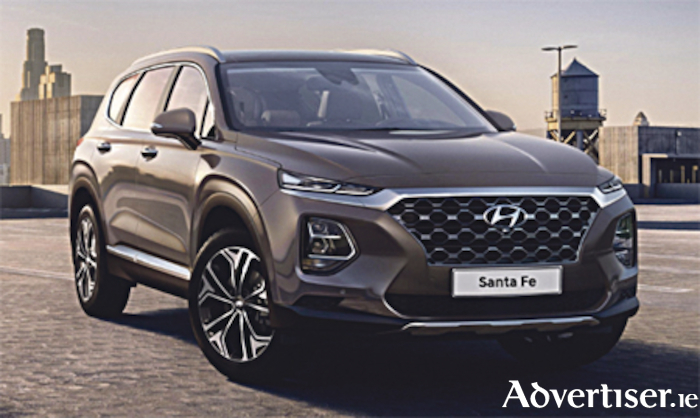 The Santa Fe features more high-strength steel than any other Hyundai vehicle with 57 percent – that is 15 percent above the previous model.